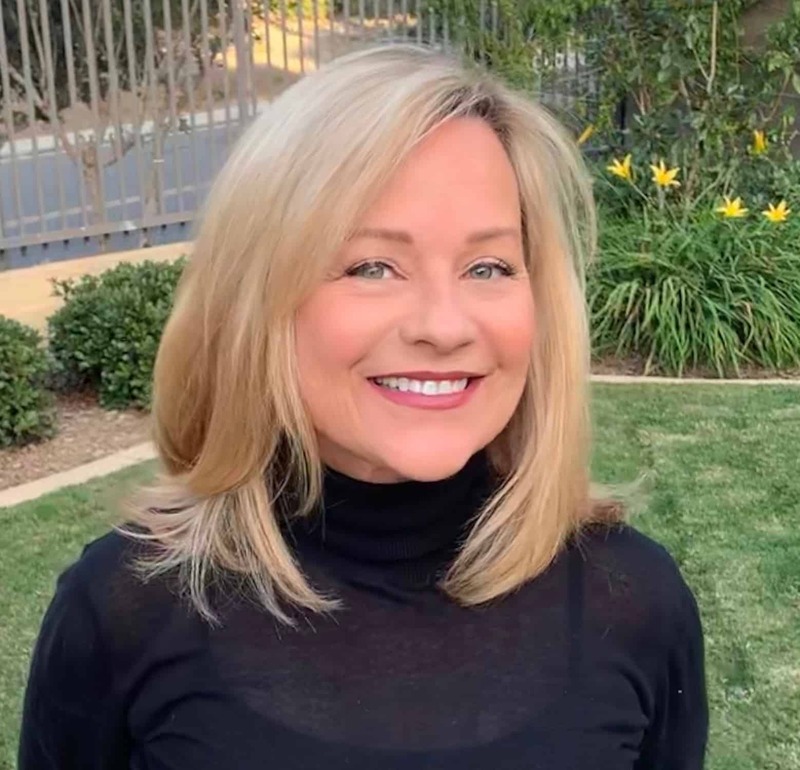 of her lovely Newport Beach, California home. I am not trying to tease you with room by room “snapshots” of Debbie’s house. …it’s just that she is a perfectionist and I don’t like to stress her out when I pull out the camera. She let me take some kitchen photos a week ago along with a couple that her sister took. our freshman year. We have been friends and occasional business partners ever since. This is her breakfast nook right now. They recently inherited the painting from her husband’s family. The light fixture is from Vaughan. The floral pillow fabric is from Raoul and the stripe is from Bennison. This is our “hang out” spot. This was how it looked before. Debbie designed the interior window (there is a hallway on the other side) to bring more sunshine from the patio into the kitchen. The bar stools are from Ebanista. The island lights are by Urban Electric. I toured their factory in Charleston, SC. They are famous for beautiful American craftsmanship. I like the under the counter microwave (we did the same thing). The blue wool Indian rug is from West Elm. Doesn’t it look great with the painting? next to a bar sink with filtered water. There is extra refrigerated GE Monogram beverage storage here. The counters are from Walker Zanger (black honed granite and statuary marble). 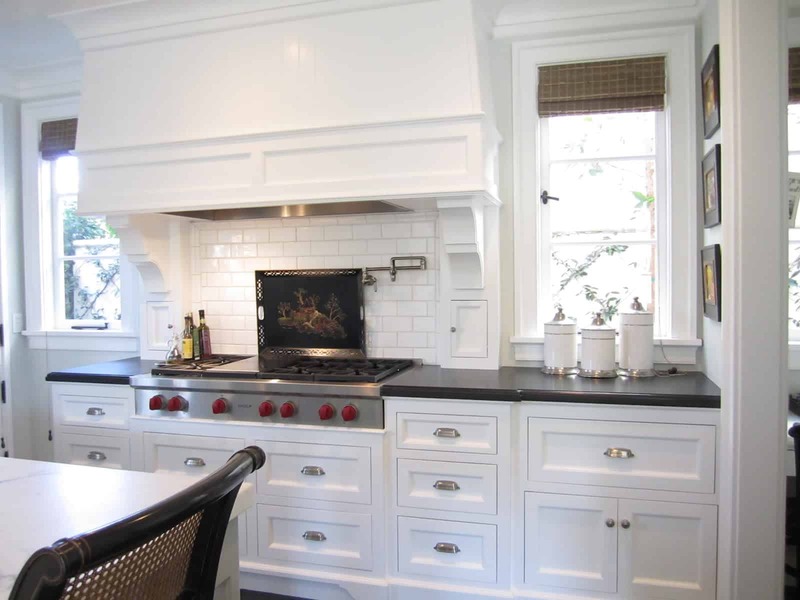 How cute are those tiny cabinets below the hood corbels? Love the kitchen! The lighting is absolutely stunning over the island! Thanks for sharing! That is so beautiful! Thank you for sharing with us! I loved seeing Debbie's kitchen. It is perfection! Love that painting, love the upholstery too. The marble and black granite are gorgeous. I'm in the middle of a kitchen remodel too. Waiting this morning for that 60 inch Wolf to be delivered. All 900 lbs! So gorgeous. Those lanterns grabbed my attention right off. Mary Ann, It is gorgeous! You know I am a sucker for all the ginger jars! and the pendent lights I love! The painting is beautiful!! thanks for sharing. Have a great weekend! Thank you for sharing, Maryann. Very inspiring. Love the light in the room! 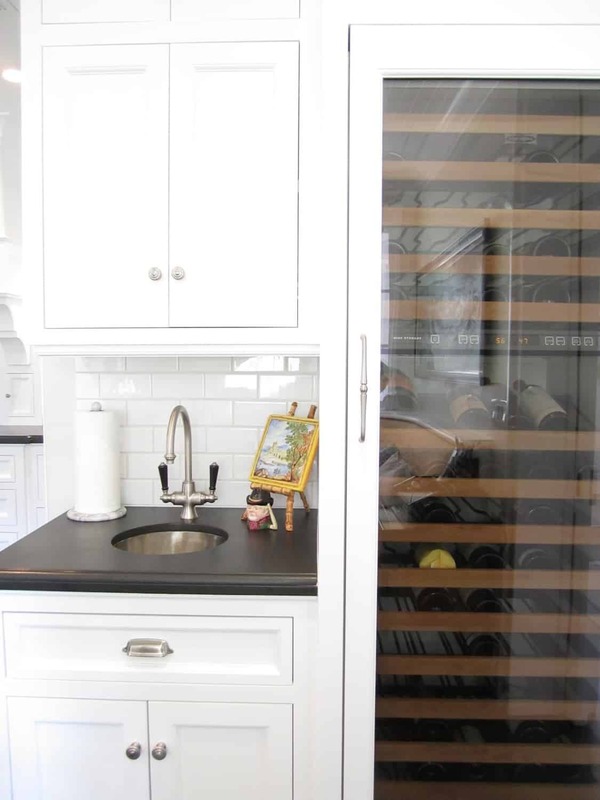 That is seriously my dream kitchen – you're living my dream, Debbie!! Thanks for sharing with us, Mary Ann! I'd happily take your kitchen as well by the way! Love this gorgeous kitchen!!! perfection is right…I would never complain about doing dishes, cooking or cleaning up this beauty! and love her choice of flooring…had to take a good look because at first I thought it was dark wood…thanks to you and Debbie for letting us take a peek. Now this is ONE GORGEOUS kitchen! Love everything about it. Thank you for sharing your friends kitchen, Mary Ann. The lanterns, the touches of blue…just gorgeous! I love the bar stools too! Thanks for brightening up my day! I'm in love with her kitchen. Looks so beautiful. Those cabinets are amazing! I am dying with envy. That painting is so amazing. I love it all!! I'm so thankful she lets you share her home with us. Ah, THANK you for this kitchen tour! Fabulous!! It does seem crazy that I have so many friends with such great taste! Your friend has a wonderful kitchen. It's so warm and elegant… a place you want to spend time in. Have a lovely weekend, Mary Ann! Wow!!!! I just pinned some of these images and then here they are on your blog. The blue and white collection makes me weak in the knees! *** DITTO to EVERYONE above's comments, MaryAnn!!! Debbie's house is just wonderfully & beauuuuutifully done!!! I… love… it… all… every square inch shown!!! (ESPECIALLY the GINGRER JARS and those INCREDIBLY UBER-FAB LANTERNS…. ooooooh la la!). I agree with the comment (above your reply)… ALL your friends seem to have terrific taste~~~ then again, you ARE in Newport, and I wouldn't expect "less"!!! And that makes getting together & "girl times" SO MUCH FUN I should BE so luck… NONE of my "friends" are that into it all… (*%&^#^$%*!!!!!!!!!!!). Warmest thanks to Debbie and you… raise a glass on me, ok? So fun to get a peek inside your friends abodes! ALways jaw dropping and inspirational. 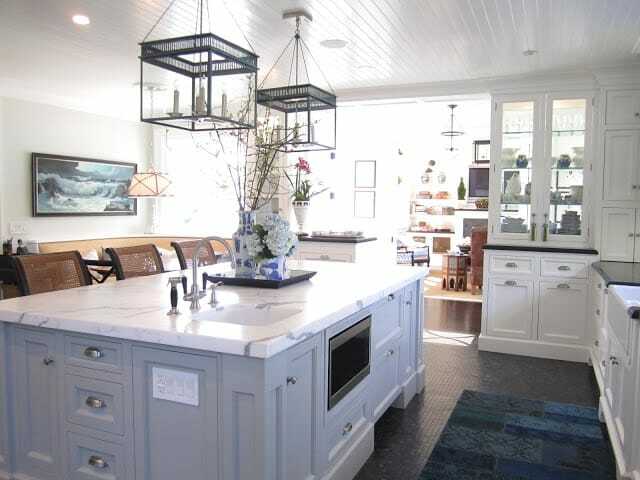 Holiest of Holy….that is one stunning kitchen…..and that WE rug is to die!!! Love…Love…love…the Urban Electric lanterns…what is not to love in that space! OK Now that I have picked my jaw up off the ground! WOW, how stunning and so beautifully decorated. Have a great weekend and thanks for sharing! Wow! You and your friends have the best kitchens!! Difinitely my kind of kitchen!!! So pretty and fresh feeling. I of course love her beautiful display of blue and white and the pretty lanterns! That banquet is so great looking too, love her fabric choices! Love, love this kitchen. I want her house! Maybe she wants to trade! Excuse me while I whipe the drool off of my desk. This kitchen is stunning…kinda like YOURS! 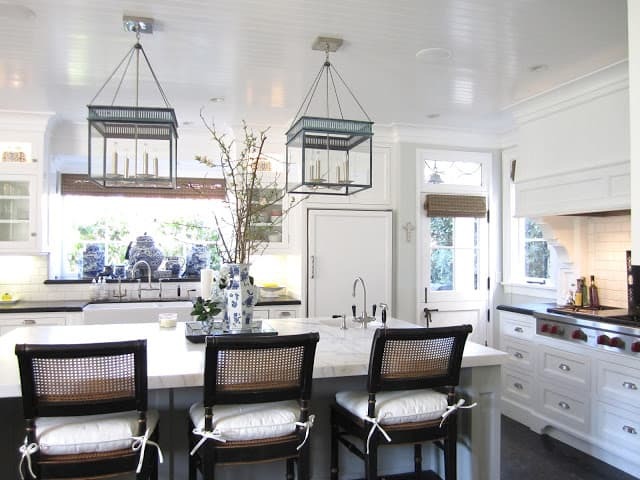 What a gorgeous kitchen…I love it all!!!!! Oh my…I absolutely love it all…what does she store in those tiny cabinets below the hood corbels? It's kind of remarkable how many friends you have that all have the same fabulous style in kitchens and houses…sometimes I get confused which house is which. I love the floor…can we please discuss this further…I'm still trying to figure out our floor in CT. I do love her blue and white collection…actually I just love it all. Perfectly beautiful…. I wouldn't dare change a thing!!! Would love just a teeny peek of the floor… Dare I ask? I wouldn't need anything but a tiny glass of water and just pretend it was mine! She did a awesome job! There is so much to love in that kitchen, and yet I just can't go past the wine fridge. Debbie is clearly a lady with her priorities straight! Absolutely STUNNING! Her collection of blue and white makes such a statement! White kitchens are here to stay with inspiration like this! I love Walker Zanger, they have the best tile going. We traveled from Canada to Montana to pick up our tile for our kitchen backsplash. It was well worth it. I don't know what more I could say about this truly stunning kitchen. All above remarks express my feelings for what is the most beautiful kitchen I've ever seen! I HOPE she will let you share other rooms in the future, I know they are just as wonderful as her kitchen. Do you think she would tell us the color she used on her walls? Thank you for making my heart throb this morning. I think the word perfect pretty well sums it up!! Beautiful! 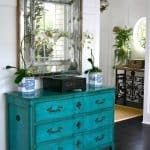 I love all the pretty touches of blue! Gorgeous! That is kitchen perfection. I adore the nook, and though the painting is, I am sure sentimental, I liked the pics she had up on the wall prior. But it is just STUNNING. The whole thing. Thanks for sharing! Lucky you to have such a fab spot to hang out with your girlfriend! What a gorgeous kitchen! Love the banquette and could imagine lounging in that nook. Love all the little details, like the little cabs under her corbels. Simply stunning! Thanks for sharing. What a great kitchen. Can't wait to see more of this lovely house. Yes, it is stunning! 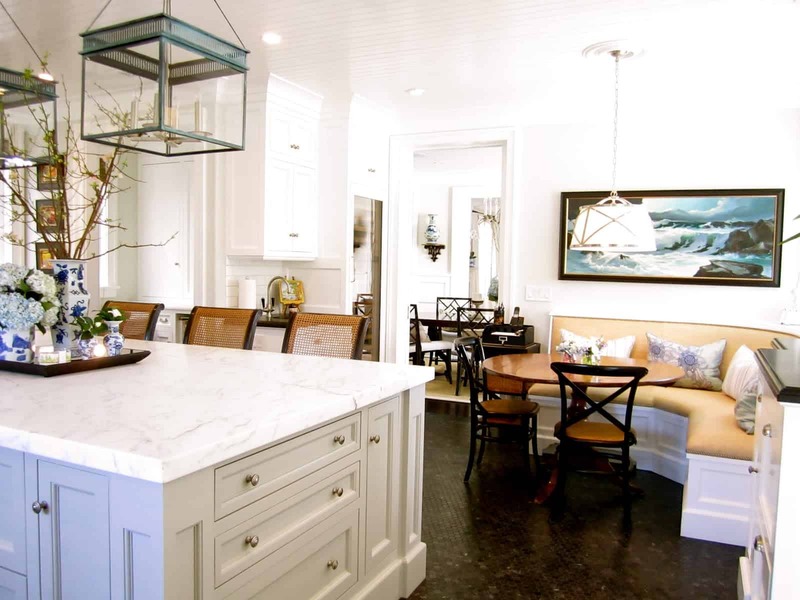 I'd love to have that big gorgeous slab of marble on my island! My granite is Mostly black. Does anyone know if you can hone polished granite? Thank you Debbie, for sharing! This is my kind of beach house kitchen, Mary Ann. I am totally obsessed with the Urban Electric lights, and the paneled ceilings give a beachy feel…love every square inch!! May I join you two for coffee at the banquet?! This is gorgeous! 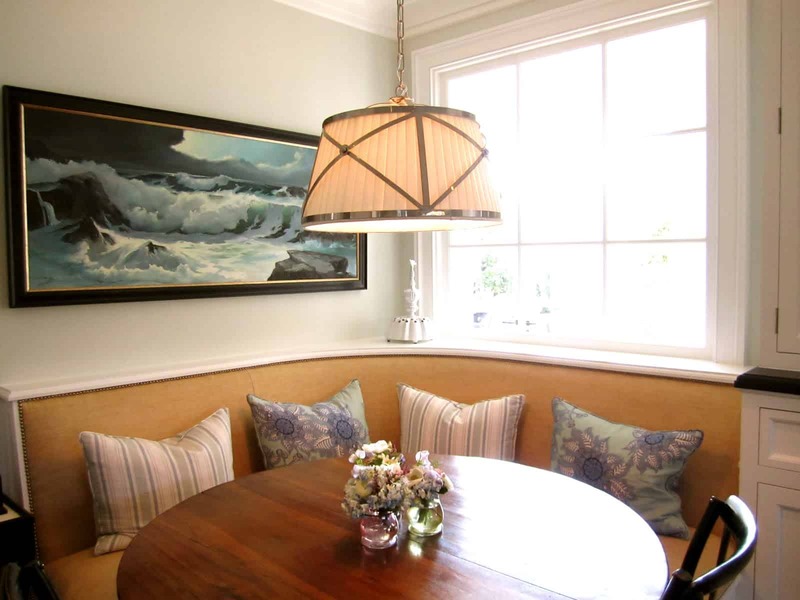 I love those lanterns and the banquette is fabulous. 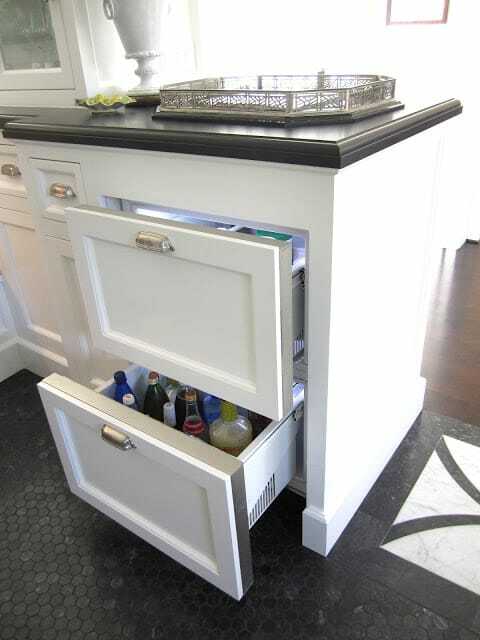 Simple and classic with lots of great storage. I love the clean palatte too. That kitchen is just amazing, beautiful! i visited newport beach for the first time earlier this year and fell in love. my husband and i have actually discussed moving there. This space is gorgeous and refreshing! I love the blue and white accents. I'm saving this in my inspiration file! Thank you and your friend so much for sharing her kitchen! I'm going to come out and visit and then you can take us all on a nice house tour of your home and friends homes – and then we can have a big party. Doesn't that sound like fun?! Your friend's home is so beautiful – I love the breakfast nook in the kitchen and have always loved that pendant fixture. And the Urban Electric lanterns over the island are also really pretty. Love everything here just beautiful. So lovely to be back visiting you my friend I have missed seeing your wonderful posts and have enjoyed catching up with them all. Hope you have an amazing Valentine’s Day. I love the fresh, airy, clean look of everything! Esp the style of the built in banquette,that's such a comfortable way to dine. This kitchen is so beautiful. 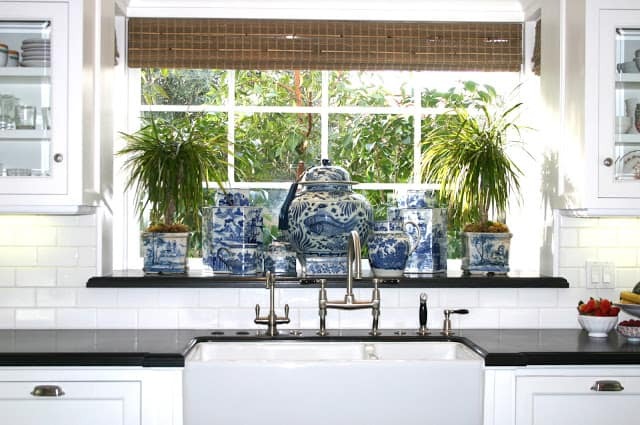 We love all the fabrics and lighting in the interior kitchen space. Gorgeous! I love all the blue and white, it makes everything feel so airy and bright. Thanks so much for sharing this beautiful kitchen. What an incredibly beautiful kitchen! Thank you so much for sharing this inspiration. Oh thank you soooooo much for sharing this beautiful kitchen! I am trying to "talk" a client into the same VC fixture and she is unsure about the pleated shade…maybe this is the push needed!!! Love it all = absolutely fabulous!! Great design! I love the interior window idea. Is the island honed, also? Does she have to baby the white marble? Please let us know what is the paint color and gloss level on the island cabinets. It is a delightful change to the white and compliments the marble. is this honed and it is prone to showing dust/dirt because of its color? My grandparents had the same oil painting in their home, seeing it in this home has brought back lots of great memories, thanks! Love it… What color paint color is he island? What is the white paint color on the cabinets? Love that it's not blue or creamy, just striking white. Thanks for sharing these pictures again. I love Debbie's house and I go to your pictures for inspiration now and then. When you redid your blog layout I could no longer find Debbie's house tour. This is just so beautiful and clean. I love everything! 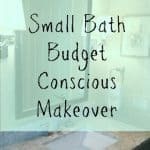 Thanks so so much for linking up to my Bash, Mary Ann! Wow…..Think I know who the painting is by. What a treat it would be to,sit in this beautiful kitchen and enjoy the beautiful kitchen…….. 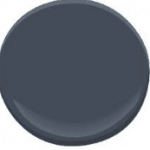 I would also like to know the paint colors. The white and gray….thanks.